Welcome to the first ever Book Gawker Book Club Meeting! 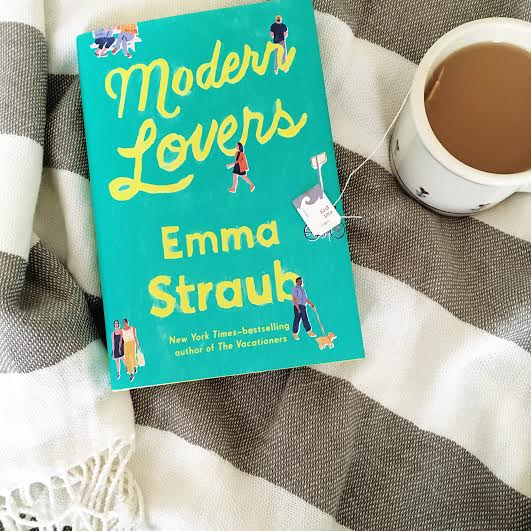 I am thrilled that you've joined me in reading this month's book club pick, Modern Lovers by Emma Straub and I'm dying to know what you thought! I absolutely loved this novel. I'm not saying this because I chose the book for my first book club post and I didn't want it to be a dud. I hope you all enjoyed it as well - and I typically don't talk up books just for the sake of a good recommendation. I can honestly tell you - I LOVED this novel. Emma Straub is magical. Her storytelling and character development is bar none and this is one of my favorite books this year. I felt that this story with its zany characters and quirkiness was witty and entertaining. I loved the juxtaposition of the young lovers' story with that of the older lovers in the story. The older couples each navigating their way through marital challenges and their children falling into what can only be described as a teenage whirlwind romance that is (let's face it) doomed from the start. Each character had his or her own unique struggle - and I thought that Emma Straub pulled their differences and uniqueness together beautifully in the end. This book really was about friendship, self discovery, and love at all stages of life - whether it be during teenage or middle age years. Emma Straub is incredibly witty. Her characters are razor sharp, smart and sassy - I loved that about this book. The only person I just wanted to give a good lecture to was Andrew (obviously) - but then it was apparent he was in definite need of some directional guidance so I'm going to throw him a bone there. One thing that I loved about this book was that it is incredibly smart but not overwritten. The prose was easy to read and enjoyable. I wasn't getting hung up on superfluous language or passages that were over my head. I found it to be to the point and funny. Iggy Pop's return seemed downplayed a little to me. I mean, Elizabeth spent all that time making and hanging posters around the neighborhood, and I felt that his return was overshadowed by Ruby's cover up for Dust. I just would have liked a little more of a party for Iggy's return. What can I say, I'm an animal person. Andrew - I'm not trying to make him out to be a bum, but he kind of was a bum! His character worked for the story and he came around in the end, but I would have liked to have seen a little more depth to him. I think behind the lost little boy looking for acceptance/distraction there were some other issues that made him more complex than he initially appeared throughout the book. Feel free to discuss in the comments, on Instagram or over at the Book Gawker's Facebook page! You're also more than welcome to link to your own post about Modern Lovers in the comments! I'm excited to know what everyone thought of this novel! Also, I'm taking requests for July's Book Club pick - let me know what you would like to read! July's book will be announced on June 30 - so be sure to check back!! What did you think of Modern Lovers? Did you enjoy this novel? What worked for you, what didn't? Writing style, character development, storyline were all wonderful! I just wish that there had been some additional details added. Mine was Ruby. I just loved her waywardness. She pretends to be a badass but she's really just a confused girl trying to figure it all out. Her ending was one of my favorite moments in the book. Naomi was another favorite - I thought she was funny and terrible all at once. I was actually really happy with the ending of this book. I felt that everyone found what they had been looking for which made me happy. I was a little surprised though because I feel that I'm getting used to bittersweet endings, so I fully expected a tragedy in end. What would you ask the author about Modern Lovers? What was your writing process for this book and how did it differ from your previous work? What did you want to do differently with this novel? Would you recommend this book? Why? Why not? Absolutely! This has been one of my favorite books this year. If you haven't finished the book - are you planning to?